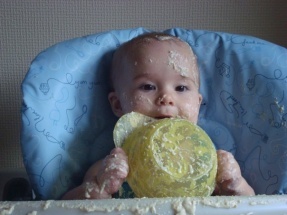 We asked Nicki, mummy to Ben and Charlie, to tell us a little about baby led weaning and her own experiences and she explored this concept with her youngest child, Charlie, born 16th October 2008. Gill Rapely (Director of Unicef Baby Friendly Initiative) came up with the concept of baby led weaning which baisically involves not giving purees, instead giving your 6 month old baby finger foods from the beginning and letting them choose what and how much they want to eat. Research showed that six months was the optimum age, which is the time that mothers are now being told to wean by Health Visitors according to the World Health Organisation guidelines. When the weaning age was 3-4 months, baby’s were given finger foods at 6 months after getting used to purees so what is the difference? 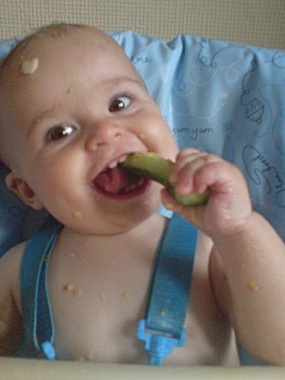 Babies are developmentally ready for finger foods at this age so why bother with mush. 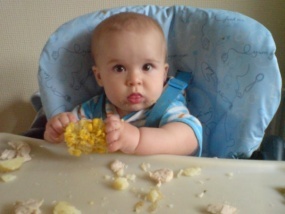 So, baby led weaning, what does it involve I hear you ask?? No purees, no ice cube trays, no food processor, no potato masher, no baby rice, no mixing everything with expressed breast milk or formula, no weird combinations of fruits and vegetables, no spending hours and hours making and blending food and then freezing it. Simply, it is you and your baby eating food together. Your baby decides when he/she is ready to eat something and is not forced to eat food just because they should be. 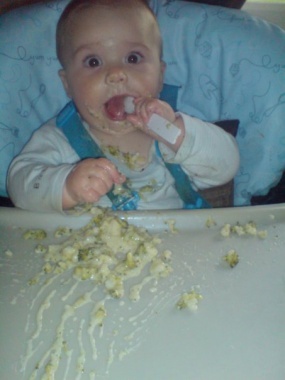 When you do baby led weaning the baby is in control of what goes into their mouth and so by using the gag reflex they can get rid of food instinctively that may cause a problem. This is not choking but can be quite scary. It makes lots of noise but the piece of food that went to far back will pop back onto the tray. Gradually this hardly even happens as they have learnt how to move the food round in their mouths. 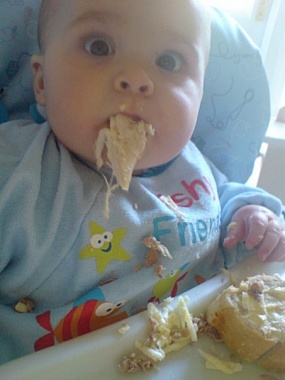 If you had done baby led weaning from the start your baby would have learned to chew before swallowing which is why the statistics say that a baby led weaning baby is less likely to choke than a puree fed one. 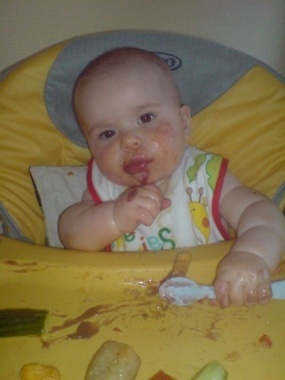 However it is totally possible to start baby led weaning if your baby has been eating purees. 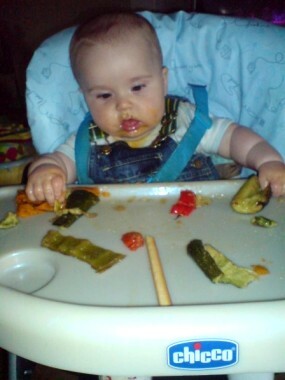 Is it ok for my baby to be eating lots of fruit and veg to start with ? Yes, and it is also ok to start offering her more carbs, as long as you keep an eye on the allergies / food to avoid till until they reach a certain age. Nutritionally, is it ok that she is just having fruit and veg at 6.5 months old? Milk is her main source of nutrition until one year old and solid food is just an add on for practicing and fun. 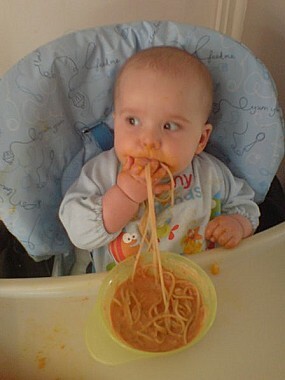 Baby’s have this problem no matter what age they start with feeding their selves. It's all part of the learning process. If he wants it again he'll either pick it up and try again or pick another similar looking bit, and try again. Should I introduce one food at a time? It certainly isn't a recommendation of Gill Rapleys. Anyway, if you actually followed this stringently it would take years to wean a baby! The main thing to keep an eye on are things that you may suspect will cause a reaction based on family history etc. My baby cant continuously sit unaided should I start them weaning? As long they can sit quite well in the highchair, with only minimum support and without her head and body slumping then that is fine, the idea is that the digestive tract is open and not compressed, which can increase the chance of choking with purees or solid food. I started Charlie with purees at 5 months, why ? because I was too excited to wait – I brought baby dishes, pots, suction plates, spoons, a blender, etc – what happened? Charlie hated it – he was sick, he hated me trying to put a spoon in his mouth. So... 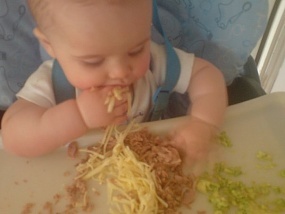 I looked more into baby led weaning, I was very nervous about doing this for the same reason most people are, the choking. However, there is a big difference between choking and gagging. Babies of this age have a gag reflex so if anything gets past a certain point they will gag and spit it out, this is the safety mechanism to stop them choking. Charlie has been doing baby led weaning for nearly 6 months now and has NEVER choked, gagged plenty of times but he sorts himself out quite easily, I do not intervene. The first few months Charlie chewed his food with no teeth, now he has teeth he can bite chunks for himself, and he has always eaten the same food as us (which made our diet a lot healthier) and the most important thing of all he loves mealtimes. I eat my dinner hot as we eat at the same time, and we all eat together. If anyone is looking at weaning this way I would be happy to answer any questions you may have. Simply post your questions on the Baby Chaos forum here. Nicki has her own handmade cards and stationery business. Nicki can make anything you like, for example, new baby, Christening / naming day cards and invitations, childrens party invitations.